The Just Sleep range isn’t an evolution. We started from a blank sheet of paper. We transformed our design process. And then we had to transform our manufacturing process. We've made a mattress using technology and materials created by a world class team of developers and designers, but simply designed for a great sleep. Why all the effort? 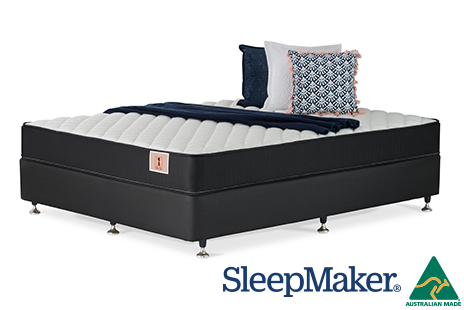 Because we just want all Australians to be able to sleep on a SleepMaker mattress. Just Sleep is the perfect solution for anybody who wants an Australian made mattress from a reputable manufacturer, at the best possible price. All Just Sleep mattresses feature a choice of spring systems and comfort layers to suit any budget and comfort preference. The Omnicoil continuous coil support system is designed to assist with weight distribution and durability. The Omnipocket coil support system provides contouring support and durability. Ultra-Fresh antimicrobials help to keep products fresh, hygienic, and odour free.